I can’t recall when exactly I learnt or heard of root beer but as I stood by the table, ready to pay for a drink and burger at the annual 4th of July ceremony for ‘Americans in the Hague & environs’, something clicked and I reached for a can, not without asking the guy on the other side if root beer tasted like ‘ginger beer’. To which his response was ‘no’. I lovingly held my brown can of A&W as a gorgeous dark-haired girl in a turquoise dress enthralled the audience with her rendition of ‘God save America’. I had never felt prouder to be linked to ‘America’, even if it was only by virtue of my kids going to the American school. People have claimed citizenships for less so I figured I was in good stead. Root beer is a carbonated, sweetened beverage, originally made using the root of a sassafras plant (or the bark of a sassafras tree) as the primary flavor. Root beer, popularized in North America, comes in two forms: alcoholic and soft drink. The historical root beer was analogous to small beer, in that the process provided a drink with a very low alcohol content. Although roots are used as the source of many soft drinks in many countries throughout the world (and even alcoholic beverages/beers), the name root beer is rarely used outside North America and the Philippines. Most other countries have their own indigenous versions of root-based beverages and small beers but with different names. What is it though about music that makes us stand still, that wraps our hearts in an embrace so strong, our eyes water? As the lady sang, her voice tugging at my heart, I was bathed in a warmth and grace so strong – I thanked God that I was able to celebrate the 4th of July and proclaim independence with America. 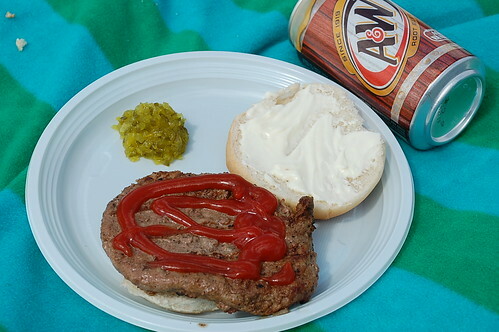 After a reading of a section of the constitution, I picked up my burger, covered it with tomato ketchup (only by Heinz) and tried some chopped pickle from a squirty tube. And then sat down on my checked picnic blanket to enjoy some root beer. Except that the first sip was ‘…not nice’ at all. I think I’d longed so much for Ole Jamaica Ginger Beer that my mind had built this wonderful construct around root beer and its inherent virtues. None of which my mouth agreed with. Struggling to place the taste and flavours, I managed to force my husband to have a taste – and then we agreed that ‘cough syrup’ was not a bad moniker. 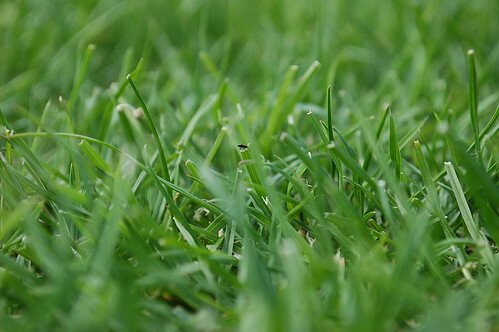 And so it was that I left the half can lying on the grass while I grabbed a few minutes of summer sleep…in the heat. 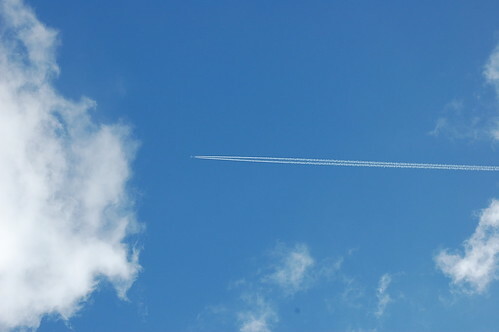 Watching ants play in grass…..
…and airplanes soar in the skies. When my husband began to clear up and asked to throw the can away, I said ‘no’, convinced that there had to be more to root beer than I knew. I was so glad when an American friend stopped by and I asked, rather gently and not wanting to offend ‘ Please, what’s the point of root beer, I don’t get it’. She smiled. A big smile and said (more or less), oh root beer on its own isn’t great. What you need to do is have a float’. 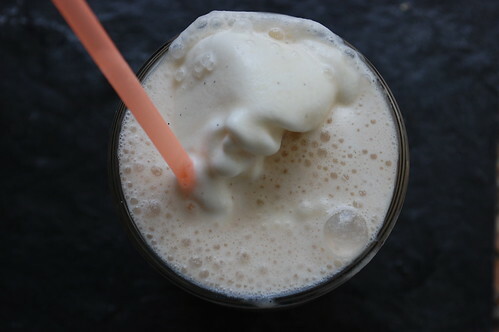 A root beer float – Root beer and vanilla ice-cream. And now it was my turn to smile and with all I could muster, make a fist of my right hand and push it back with a loud ‘yes’. Yes, for I now understand the purpose, yes for not throwing away the rest of my root beer, and yes for even though no shops would be open in my neighbourhood on a Sunday, I knew just where to get great vanilla ice-cream. With profuse thanks, I expressed my gratitude for yet another lesson on American customs and traditions. I headed home, sated and warmed by the display of American affection, my eyes seeing red, white and blue stars and stripes. In a flash I’d dumped all my gear, grabbed the car keys and headed to the ice cream shop. Two scoops of vanilla ice cream in hand, it was home to test this out. It’s hard to say what’s more delicious – that first spoonful of flavored foam that bubbles up over the top of the glass or the soothingly cool marriage of cream and carbonated sugar drink that happens after you give the float a stir. Some folks call it a black cow; some call it a brown cow. 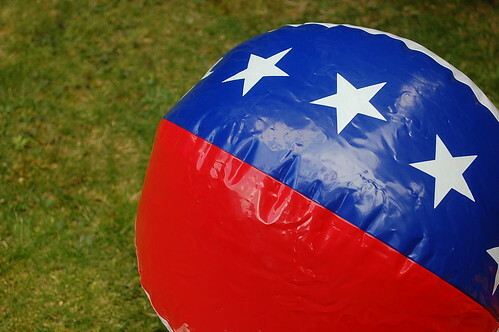 We won’t quibble here: We just call it a fun, all-American antidote to the heat. And a root beer float is a distinctly American refresher. Although some sources say root beer dates to the Colonial era, Philadelphia pharmacist Charles Elmer Hires is most often credited with inventing the drink we know today, brewed from a powdered mix of roots and berries (the primary flavor being sassafras). Hires first offered root beer at the Centennial Exposition in 1876 and began selling it in ready-to-drink bottles in 1890. Root beer also begat the first drive-in and the first fast-food franchise, according to the A&W website. 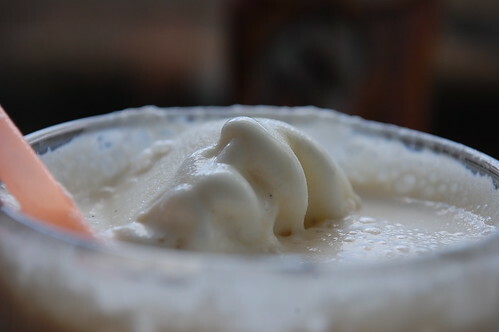 The root beer float is traditionally made with vanilla ice cream and root beer, but can also be made with other flavors. In the United States and Canada, the chain A&W Restaurants are well known for their root beer floats. The definition of a black cow varies by region. 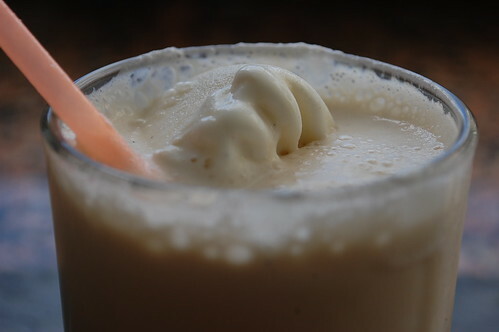 For instance in some localities, a “root beer float” has strictly vanilla ice cream; a float made with root beer and chocolate ice cream is a “chocolate cow” or a “brown cow.” In some places a “black cow” or a “brown cow” was made with cola instead of root beer. And easy too it was. 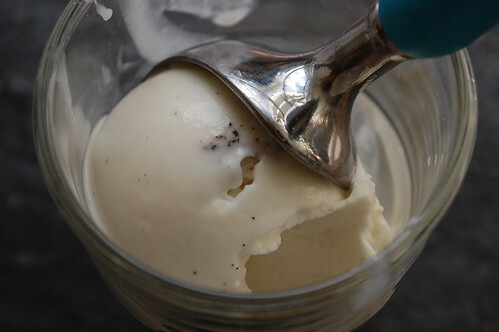 Put ice cream in glass. Mug. Cup. Right, so what if my root beer was warmed by the day’s sun, still the balls of vanilla ice floated didn’t they? And even if the characteristic froth was absent, who dares call this different? All I had to do was pour root beer in slowly and watch the ice-cream float to the top, leaving distinct layers of root beer, root-beer and vanilla icecream and a frothy, creamy topping. Elise of Simply Recipes says ‘Next to a vinegar and baking soda volcano, a root beer float is God’s gift to chemistry experiments for kids. Not that we cared at all about the chemistry. Where does the foam come from? Little bubbles of carbonation sticking to the sides of the ice cream and attracting other bubbles until the bubbles get really big and float to the surface. (You can read all about it here.) And why does the ice cream float? 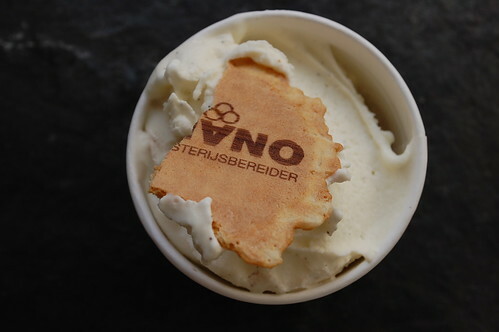 Because it’s ice cream, churned with air and composed of a lot of fat, both which are lighter than water. One orange straw later, and a long draw and I got the point of root beer floats. 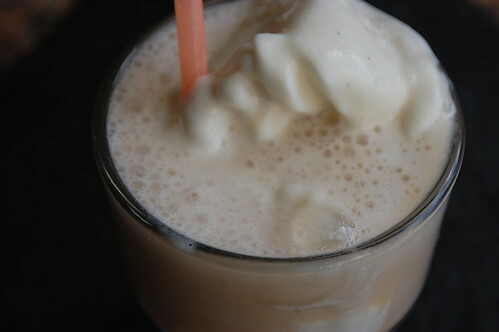 The harsh, licorice flavours of the root beer mix with vanilla and end up in a milk-shake type dance. Saying that though, I’m off this week to find me some ole Jamaica ginger beer. That will ROCK on a hot summers day in a float – my entire world has opened up. This summer and beyond, I’ll be ‘floating’ with cola and malt, and ginger beer all the same!!!!!! 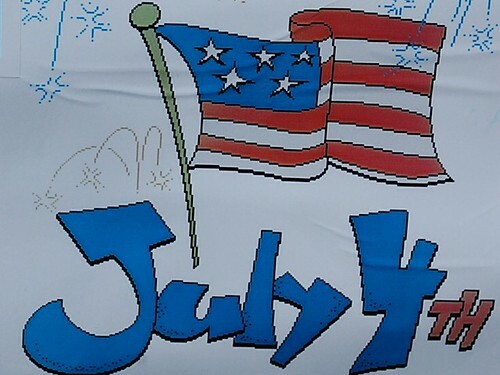 Till then my friends, happy Fourth of July and may freedom of speech, song, thought and ‘what to do with root beer’ reign for ever. Bring on the vanilla ice cream baby! 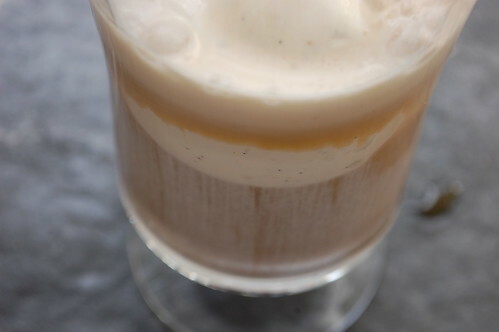 It’s hard to say what’s more delicious – that first spoonful of flavored foam that bubbles up over the top of the glass or the soothingly cool marriage of cream and carbonated sugar drink that happens after you give the float a stir. Some folks call it a black cow; some call it a brown cow. 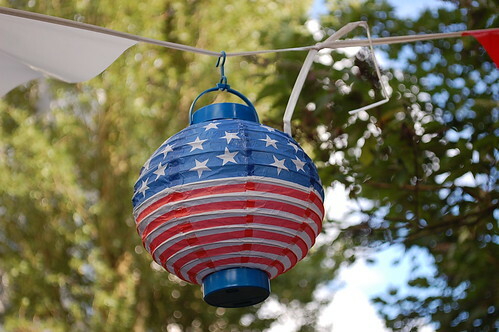 We won’t quibble here: We just call it a fun, all-American antidote to the heat. And a root beer float is a distinctly American refresher. Although some sources say root beer dates to the Colonial era, Philadelphia pharmacist Charles Elmer Hires is most often credited with inventing the drink we know today, brewed from a powdered mix of roots and berries (the primary flavor being sassafras). Hires first offered root beer at the Centennial Exposition in 1876 and began selling it in ready-to-drink bottles in 1890. 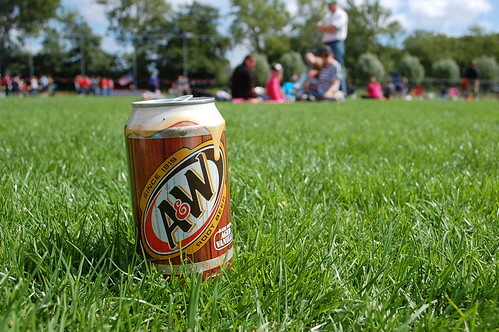 Root beer also begat the first drive-in and the first fast-food franchise, according to the A&W website.